This is just an early heads up that I'll be launching a new mobile-centric podcast later next week called the All Mobile Everything Podcast. The podcast will be hosted on the All Mobile Everything site starting the third week of April. I'll be releasing the podcast every 2-4 weeks, and will be covering a lot of topics relative to mobile strategy and mobile development. Until then, I am headed out to the Xamarin Evolve conference in Austin, TX. You can expect some coverage of that event in next week's [the] first episode of the All Mobile Everything podcast. Stay tuned! Update: I've been second guessing starting this podcast until after I release my next app. Please check back again in the coming weeks or let me know on Twitter what you think. 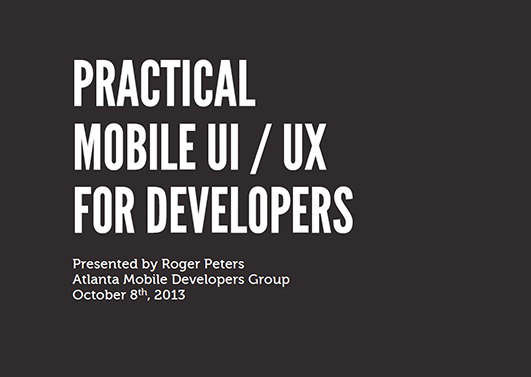 Sorry for the late notice, but I'll be presenting Monday at the Atlanta Windows Apps Meetup in Alpharetta. You can find out more about the meetup (which is Monday February 4th, 2013) here. Have an idea for a casual game? Not sure where to start? In this session we'll discuss two of the main ways you can create casual games today for Windows 8. We will review how the game Word Search Little Books was built for Windows 8. We'll also talk a bit about how parts of that same source code was leveraged for an iOS version as well. 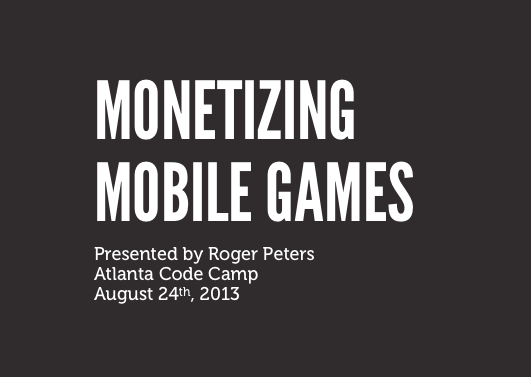 We will also review the MonoGame platform and other ways to create games for Windows 8 and other mobile platforms. If you've created games for Windows 8 already, then please come and join in on the conversation! My presentation will be largely focused on various ways to get into mobile game development, and will talk a good bit about cross-platform solutions and monetization. Hope to see you there! I've been heads down coding the last few months. From writing Word Search Little Books for Android, Kindle Fire, Windows 8, and iPad/iPhone, to now porting an old personal favorite to iOS (more on that soon enough) - I've been too busy doing to share how I've been doing it. After spending some time last year looking at cross-platform mobile solutions, I decided that Xamarin's MonoTouch was the best route for cross-platform mobile development - and it has been great. I wanted to take a few quick minutes to show my fellow .Net devs that they can (and should) develop for iOS/Android using their existing C# knowledge (and code) with MonoTouch and Mono for Android. Please let me know if this video was useful to you. I'm considering doing a larger more in-depth series on MonoTouch development if there's any interest - I would love to share more with others who might be interested. I'm very excited to announce that Word Search Little Books is now available on iOS! I ported the Windows 8 version to iOS using Xamarin's MonoTouch - and it worked out great. Both the iPad and iPhone versions support landscape and portrait, and include the same in app purchases and puzzle books found in all the other versions. This is the first app I've released on every major platform. I learned a lot doing it. 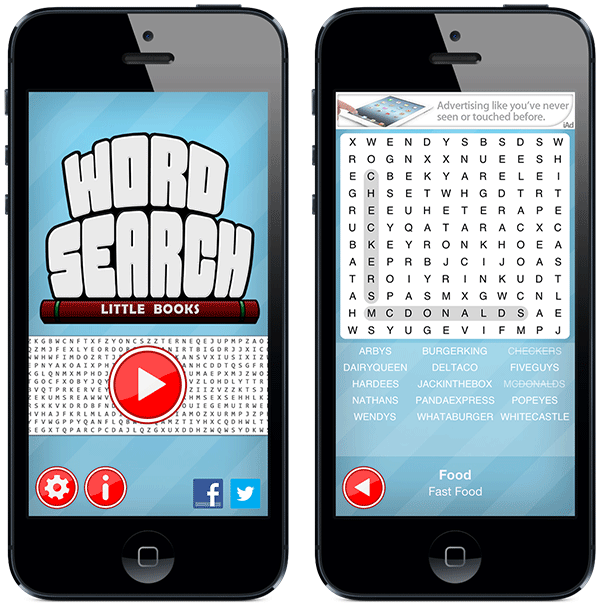 You can now get Word Search Little Books from the iTunes App Store, Google Play, Amazon Appstore, and Windows Store. It took around 3 working months to get it all done - and next time it will take half that. In case you missed it, I started my own consultancy for mobile development - All Mobile Everything. Get in touch if you need help getting your apps and games on every platform that counts.